If sea and countryside views from your terrace is what you're looking for, Villa Rhea has it all. Located in the area of Peyia, this pleasant 3 bedroom property is within walking distance of restaurants and just a short drive away from the popular resort of Coral Bay with its sandy beach and great choice of cafes, bars, shops and restaurants. Pool heating, air conditioning/heating and WiFi are included. A spacious pool area with great views across the countryside to the sea - I just love it! The large pool terrace is dotted with sun loungers and a lawn area - great for a ball game or just relaxing in the sunshine. 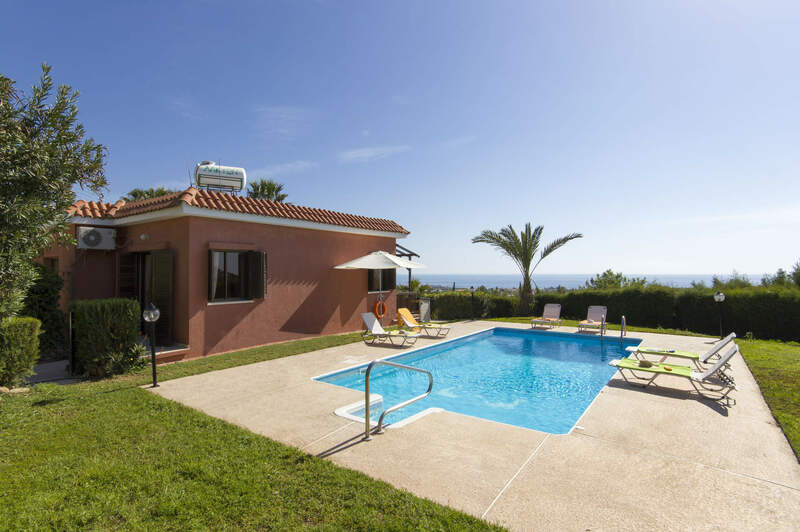 The villa is equipped with a brick built BBQ which is great for alfresco dining as well as a pool table and table tennis to keep you entertained. The terrace wraps around the villa and a few steps up lead to a covered balcony great for relaxing and enjoying those distant seaviews. There is space for your hire cars at the front of the villa, the entrance door opens into the living area. The living is kept bright and airy by the patio doors opening on to the balcony with a table and chairs. The space is furnished with comfortable sofas and a flat screen TV. Adjacent is the utility room. The fully equipped kitchen has worktop space and modern appliances to create anything from a refreshing drink to a traditional Cypriot meal. There is also a patio door from here which takes you on the wrap around terrace with access to the BBQ area and pool terrace. With the villa being on one floor this is a great choice for families. There is a bright and homely double bedroom with an en suite shower room. In addition there area 2 twin bedrooms both with small private terraces, 1 of which has steps leading directly to the pool terrace and has great views across to the sea. Adjacent is a shared bathroom. Villa Rhea is located just a short drive from the buzzing resort of Coral Bay meaning you'll be within easy reach to shops, restaurants and bars, plus the beaches of Coral Bay and Corallia. The authentic village of Peyia is also within a short drive and has a few local tavernas serving delicious meze. You can also visit its municipal gardens, which are a popular venue for weddings. Our Villa Giota is next door..
A short drive away is the popular resort of Coral Bay, which is perfect for some retail therapy with its leather and souvenir shops. If you're looking for something a bit different, Paphos Old Town is only 25 minutes away by car. There are quirky and small boutiques as well as a large shopping mall. Alternatively, in Paphos there is a farmer's market at weekends where you can buy fresh fruit and vegetables, lace, leather bags, olive oil products, souvenirs and other local items. There are a few restaurants along St George Avenue where the villa is situated serving both Cypriot and international flavours, plus Coral Bay Resort is just a short drive away offering various cuisines. If you head up hill to the village of Peyia there are plenty of traditional restaurants to choose from. The nearest beaches are Coral Bay and Corallia, only a short driving distance away. Coral Bay Beach is the place to head for water sport thrills and Corallia is a smaller more relaxed beach. All the beaches in this area have sun loungers and parasols to hire. Close by the villa is Georges Horse Riding where you can trek through banana plantations - good fun for all the family. A little further afield is a go karting track, a mini golf course, Paphos Zoo and an amusement arcade. Cyprus is teeming with plenty of interesting historical places. In fact, the whole of Paphos is a UNESCO World Heritage Site. The Tomb of the Kings, Catacombs, Saranta Colones, the castle and Chacolithic Village in Lemba being just a few of the places you can visit and learn about the history. You will not run out of things to see and do! There are several golf courses in the Paphos area with Marios Golf being the closest. It has a driving range, crazy golf and even foot golf. If you want a real round then Minthis Hills close to Tsada village in the South West of Paphos is another great choice. The Akamas Peninsular is about 1 hour drive away and is by far the most beautiful location on Cyprus where you will find untouched landscape, amazing natural beauty, deep gorges and stunning sandy bays. Here you can also take a dip in the turquoise waters of Blue Lagoon or visit Lara Beach which is famous for its loggerhead turtles. Villa Rhea is not available to book for season as it is sold out. Take a look here at the Cyprus villas that are currently on sale. Paphos Cosmic Bowling located between Old Town and Kato Paphos and offers many amenities such as a restaurant, cafe and bar, free internet use, children's play area, video games and other. The bowling arena has 18 lanes for play and you can have as many games as you wish. Cosmic Bowling is well maintained, bright and spacious with plenty of seating and table areas. This is an air conditioned six screened state of the art image and sound equipped cinema located on the 1st floor of the Kings Avenue Mall. Films are shown usually in 3 different sittings and are mainly in English with Greek subtitles. Refreshments are available to purchase. Located on the 1st floor of the Kings Avenue Mall, split into indoor and outdoor play spaces. Looney land is for kids from around 2 – 10 years old. Games outside are such as, Trampolines, wavy slides, toy train track whilst inside there is a jungle gym. Refreshments are available. The amusement centre also offers a ‘leave the kids while you shop’ option. This is for children aged 4-10 only. Located on the 1st floor of the Kings Avenue Mall. The coin operated games at the arcade include games such as Air Hockey, claw cranes, Car Racers, Virtual Bike rides and much more. The Paphos mosaics situated close to the Paphos Castle and harbour, the remarkable mosaics in the Houses of Dionysos, Theseus and Aion, are beautifully preserved after 16 centuries under the soil. The mosaic floors of these elite villas dating from the 3rd to the 5th century are among the finest in the Eastern Mediterranean. They mainly depict scenes from Greek mythology. The Paphos Mosaics are one of the most historic sites on the island of Cyprus. They are considered to be the finest mosaics in the Eastern Mediterranean.